"The Capital Crime: Anatomy of a World Crisis that has Really Just Begun"
Germany and NATO: "poseurs pretend they're behaving dutifully"
A worthwhile opinion article that points out the fundamental problem either Obama or McCain will face in Afghanistan with Europeans (and especially Germans) reluctant to contribute. And - the German love affair with Obama may already be cooling. A recent SPIEGEL ONLINE headline on Obama's desire to see more European troops in Afghanistan: "Obama-Plan: Europeans Should Bleed for US Tax Cuts". Another SPIEGEL ONLINE headline on the Obama trip asks: "Will a German Speak at the Washington Monument in 2009?". The painful answer: Would anyone in the United States - other than a select band of media, diplomats and foreign policy wonks - really care? Opinion: "Eventually, we will all hate Obama too"
An interesting essay on Europe, Obama and anti-Americanism in the Times Online. "...there isn't an American president since Eisenhower who hasn't ended up, at some point or other, being depicted by the world's cartoonists as a cowboy astride a phallic missile. It happened to Bill Clinton when he bombed Iraq; it will happen to Mr Obama when his reinforced forces in Afghanistan or Pakistan mistake a meeting of tribal elders for an unwise gathering of Taleban and al-Qaeda. Then the new president (or, if McCain, the old president) will be the target of that mandarin Anglo-French conceit that our superior colonialism somehow gives us the standing to critique the Yank's naive and inferior imperialism." A slowly creeping disillusionment with Obama - should he be elected - will almost certainly replace Europe's current euphoria - once the average observer realizes that American interests remain American interests - however they are packaged. Case in point: Over the past few months, Germany's Social Democrats have continually toasted Obama and proclaimed: "Yes, we can!" Recently, however they realized that Obama will almost certainly demand more German troops in Afghanistan and quickly reversed to: "No, we can't!!!!" "Obama should only ask of us what we are able to deliver," Niels Annen -- a member of Germany's federal parliament, with the left wing of the SPD -- told SPIEGEL ONLINE Monday. "We won't increase our number of troops." One has to wonder how Obama's demand for more German involvement in Afghanistan will go over with his gushing German fans. Spiegel Online has already taken a decidedly realist tone - declaring that German's love-affair with Obama may not survive his speech this week. Obama's visit presents additional ironies: While so many Germans embrace Obamamania and a "new America" - Germany remains light years from the election or appointment of a minority to the prime ministry, presidency or any significant cabinet post. On trade, Obama will almost certainly chart a more protectionist course - which would likely conflict with Germany's economic interests as one of the world's largest exporters. Finally: It is particularly striking that so many Europeans proclaim such affection for Obama - without really being able to specifically explain why they like him so much. Simply being the leading anti-Bush is enough to be loved in Europe - yet it is the Americans who are continually accused of harboring a black-and-white view of the rest of the world. In the long history of U.S. intelligence fiascos, few have been as minutely examined as the "Curveball" episode – the source whose fraudulent claims were largely responsible for the pre-Iraq War view that Saddam Hussein possessed biological weapons. So it's worth noting what a new, remarkable report from the German magazine Der Spiegel tells us about the spy who lied. According to media legend, Curveball was a creation of Ahmed Chalabi, the Iraqi politician who headed the exiled Iraqi National Congress before Saddam's overthrow. That notion was destroyed in 2005 with the bipartisan Robb-Silberman report on intelligence. But the myth persists in many circles that, through Curveball, Mr. Chalabi had conned his neocon friends, who in turn had conned President Bush, who in turn had pressured a reluctant but spineless CIA into giving him the "intelligence" he needed to make the case for war. But Curveball was nobody's stooge. On the contrary, he is Rafid Ahmed Alwan, an opportunistic Iraqi asylum-seeker who came to Germany in 1999. His claims to having inside knowledge of Saddam's illicit weapons program quickly made him a prized asset of Germany's intelligence service, the BND. So convinced were the Germans of the reliability of his information that in the fall of 2001 they purchased 35 million doses of smallpox vaccine for fear of what Saddam might be cooking up. To mark the 5th anniversary of the Iraq War, SPIEGEL ONLINE has spewed forth a flurry of articles as predictable as they are shrill. The most recent installment is a piece complete with a 50-photo picture gallery entitled: "The Pictures of the Iraq Catastrophe: Panorama of the Perverse". What makes this gallery truly perverse is its total omission of Saddam Hussein's twenty-four year reign of war and terror - a period that could - in fact - accurately be labelled "Iraq's Catastrophe." This conspicuous omission - the fact that German media elites once again fail to remind German readers of the horror of modern-day dictatorship while bashing ideological enemies in the United States - reminds us that they have learned far less about confronting despotism than they would have us all believe. Interestingly enough, there is a similar photo gallery on the SPIEGEL ONLINE English site that does show Saddam's victims. It also shows more about Saddam's capture and fewer Rambo-style images of US troops. Why the different presentation in German versus English? Why won't SPIEGEL ONLINE acknowledge Saddam's victims to its German readers? Why are US troops presented more negatively in German? Finally - there is almost never any historic perspective when it comes to US military losses. Every loss is one too many, but there were single days in the Second World War in which the United States lost more men that it loses on average in a year of war in Iraq (roughly 800 to 900). And yet - the far left media continues to insist that America can't sustain such losses - and far too seldom is their credibility called into question for doing so. Endnote: Somehow there is not nearly the level enthusiasm at SPIEGEL ONLINE when it comes to reporting how another greedy European conglomerate admitted its guilt in greasing the bloody palms of the Saddam regime for a little profit in the UN Oil-for-Food scandal. Of course - there's nothing terribly perverse about that...right? Here's a question for you: Do you remember seeing an extreme cover like this at Der Spiegel when the Euro was weak just a few years back? Viewed in isolation - the Dollar cover might not be considered anti-American. Given the larger body of work of Der Spiegel over the past decade - however - it is difficult to characterize the "Dollar Nosedive" cover as anything but a further manifestation of the festering Hate-America bias that plagues the magazine. Particularly dubious is the use of extreme vocabulary including "downfall" and "dangers". 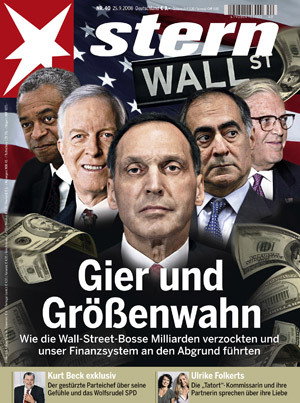 All too often, we have seen Spiegel highlight isolated or temporary problems with the American economy in an effort to convince readers that the overall US economy was on the verge of disaster and collapse. One need only recall the infamous article on unemployment in Kannapolis, North Carolina or the exaggerated claims that the American power grid was on the brink of collapse when the lights went out in New York or the claims that the US infrastructure was in "collapse" after the Minnesota bridge incident. At the same time, Der Spiegel has repeatedly avoided heaping the same sort of scorn or using the same extreme tone in highlighting the various troubles of the European economy, power grid and infrastructure despite relatively similar conditions (a weak Euro not too long ago) and incidents (power outages, train crashes, faulty infrastructure). Instead - when publishing covers on Europe - they've repeatedly engaged in overt cheerleading - (just compare these covers to these covers). Let's not forget SPIEGEL ONLINE's primative excitement when a Eurofighter apparently defeated two F-15s in a mock battle. This thinly veiled Euro-Nationalism is desirable and useful - in part - as an acceptable alternate outlet (along with large sporting events) for forbidden German feelings of national pride. Unfortunately, the Euro-Nationalism of publications such as Der Spiegel almost always counts anti-Americanism as one of its key ingredients. Perhaps Der Spiegel could - just once - run a story on America's remarkably low unemployment rate (and the jobs it has created for millions of legal and illegal immigrants) despite record high oil prices. But let's not forget - that would call into question the carefully crafted ideological caricature of the United States as hopeless social wasteland and home to predatory global capitalism. Of course one can never underestimate the bipolar inconsistency inevitably on display at Der Spiegel. (Eventually what is reported must - in some way - conform with reality - after all.) In 1999, one cover asking if Europe was a new superpower was followed only weeks later by another cover asking whether Europe could still be salvaged. The extreme contradiction can only be explained by the magazine's habitual use of the extreme to sell magazines combined with the publication's utter lack of intellectual consistency. This is nothing new - and we have seen the same sort of journalistic manic-depression on Iraq in recent weeks and months - with reporting swinging like a pendulum between utter doom and gloom - including a cover declaring the Iraq war "lost" - and reports detailing progress in Iraq and the alleged comeback of the Bush Presidency. Der Spiegel in a Journalistic Nosedive? The record lows experienced by the Dollar are unquestionably significant for the world economy. Unfortunately, a factual analysis of the economic advantages and disadvantages of a weaker Dollar has been obscured by the blinding light of media hyperbole and anti-American sentiment at Der Spiegel. This potent combination has worked to sell millions of magazines in the past - and there is no doubt that it will continue to sell millions of magazines in the future - as a significant segment of the German population continues to indulge its voracious appetite for virtually anything that casts the United States in a negative light. In the case of Der Spiegel's journalistic standards - it would be quite tempting to characterize them as being in a "nosedive." That would not - however - do the magazine justice. One must, after all, attain an altitude slightly above gutter-level to first make such a drop-off possible. Some of you may have seen this SPIEGEL ONLINE piece today - entitled "Bush Stops Assistance to Poor Children". Of course for our friends at SPIEGEL, no social program is unworthy and nothing Bush does could ever be right. So the natural spin is Bush is out to get poor children and deprive them of social benefits - allegedly because they are "too expensive." "I believe in private medicine, not the federal government running the health care system. I do want Republicans and Democrats to come together to support a bill that focuses on the poorer children," the president said, adding the government's policy should be to help people find private insurance." In fact, as David Harnasch correctly points out in this excellent German language post, Bush argues that the bill in question unnecessarily extends a government program to provide benefits to middle class children - many of whom already have insurance - in effect creating an entitlement for the middle class and furthering the creep towards socialized medicine. Instead, Bush argues that a bill should be passed to focus on helping families in need find private insurance for their children. In other words - there is a fundamental debate about the role of government and whether the public or private sector should be relied on more to deliver health care to the children in question. Unfortunately, SPIEGEL ONLINE bypasses the debate and goes for the ideologically satisfying oversimplification: Bush is Bad. In other words, the publication fundamentally fails to acknowledge that both sides of the debate genuinely want to help children in need with health care - yet fundamentally disagree on the role of government in finding the best solution. Instead, SPIEGEL ONLINE clearly implies that one side is essentially out to harm children by stopping them from getting care. Sadly, this reinforcement of existing ideological bias is par for the course in their reporting on the United States. SPIEGEL ONLINE: "The US Military is more successful in Iraq than the world wants to believe." Just look at this article. "The US military is more successful in Iraq than the world wants to believe." This all stems from last week's Der SPIEGEL magazine cover feature article by Ullrich Fichtner: An enormous, fascinating and remarkably honest report on the complex situation in Iraq. (The first link above in bolded-italics leads to the English translation of that report.) SPIEGEL ONLINE is also publishing Fichtner's report that US troops are in a remarkably good mood and have high morale. That also flies directly in the face of past SPIEGEL reporting that consistently depicted US troops as demoralized, depressed, defeated, prone to suicide and suffering from low morale. As a long-time observer of the publication, my first reaction to reading this on SPIEGEL ONLINE was: Are they on drugs?! - this directly contradicts everything they've reported for the past four years! My second reaction was: Have they finally gotten off the drugs?! Maybe reality is finally starting to sink in! Keep in mind that less than a year ago, Der SPIEGEL published a magazine cover (depicted below) declaring Iraq a "Lost War". 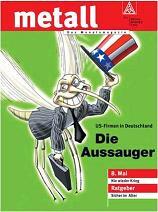 This much we can say: For once - SPIEGEL has truly done something unpredictable in terms of its USA and Iraq coverage. "Yet the universal human desire to be associated in the here and now with the assumed winning side — and to shun perceived defeat — trumps them all. Throughout this war, that natural urge explains most of the volatile and shifting views of our politicians, pundits and media as they scramble to readjust to the up-and-down daily news from Iraq. And so it is with the latest positioning about the surge that to a variety of observers seems successful — at least for now." There has been a small uproar of late among German media and political elites about plans of the United States to sell arms to Saudi Arabia, Israel and others to counter-balance the influence of Iran. Just yesterday, SPIEGEL ONLINE reported criticism coming from Germany's Social-Democrat (SPD) Foreign Minister Frank Walter Steinmeier. The day before, the same publication reported that the SPD's Karsten Voigt, the German government's "Coordinator for German-American Cooperation" was outraged by the proposed arms deal. Just more constructive criticism coming from America's concerned allies and friends? So what - other than the fact that it is politically profitable to bash the United States and Bush - could be driving the Social Democrat's sudden barrage of vocal criticism? Could this have anything to do with the fact that they are tanking in the polls and need something - anything - to grasp onto and rally the base? Wow - that is really funny. Nothing old, tired or hackneyed about those stereotypes. Bush = hyper-patriotic, Europe-despising, religious fanatic. Obwohl US-Präsident Bush sich überraschend für die Rettung des Weltklimas entschieden hat, erntet er in Europa nichts als Kritik. Seine Pläne böten nur Altbekanntes, alles sei vage und zudem in die ferne Zukunft vertagt. Klimaexperten warnen jedoch davor, Bushs Kehrtwende pauschal abzulehnen. Vielmehr müsse man die positiven Ansätze in den Vordergrund stellen. Auch stimme es nicht, dass Bush keine konkreten Aussagen treffe. So sei bekannt, dass er ein Dreisäulenprogramm zur Verringerung der Treibhausgase vorbereite: Die USA übernehmen die Führung beim Klimaschutz, treiben die Entwicklung rauchärmerer Bomben voran und treten für das Verbot von Treibhäusern ein. Although US President Bush surprisingly decided to work towards saving the world climate, he has harvested nothing but criticism in Europe. His plans are more of the same, everything is vague and postponed until far in the future. Climate experts warn, however, that Bush’s change of direction should not be totally rejected. One has to place the positive aspects in the foreground to a greater extent. It also isn’t true that Bush made no concrete commitments. It is known that he is preparing a three pillar program to reducing greenhouse gases: The USA will take the lead in protecting the climate by pushing for the development of low-smoke bombs and by pushing for a ban on greenhouses. Wow - another classic. Low-smoke bombs = stupid war-monger Americans - now that is truly funny. It just doesn't get much better than that. Move over Letterman and Leno. Oh - and we really don't buy the "Jeder kriegt sein Fett weg" argument (meaning everyone is made fun of in a relatively proportional manner). 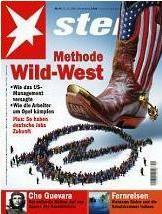 As with most of the German media - there is an obsessive and hostile over-focus on America and conservative viewpoints.